Winemaking is an art. It takes a very special person to have the ability to take a raw material like grapes and transform them into wine. There are hundreds of choices to be made at each step. One person can look at a vineyard of Pinot Noir and make something completely different than the next person. Similarly in music, many people can play guitar, but all of them play it very differently. So it is not uncommon that many artists enjoy wine. The hidden aromas, the subversion, the practice and patience it takes to produce a bottle. But the big difference is that there is only once chance a year to make that wine. There are no formulas, there is no template, and there is no sheet music. However, like any live performance, each day, the same wine changes. Many in the music industry have followed their passion for wine and have become involved in a winery. Some musicians own the winery outright, while others lend their name and work with a winery to create a label. There is even a wine club called League of Extraordinary Slurpers, or L.E.S. for short! Dave Matthews bought Blenheim Vineyards in Virginia in 1999. The area Monticello AVA, is one of the oldest grape growing regions in America. It was home to Thomas Jefferson, who has a long history with wine, but I don’t think he ever played an instrument. Maynard James Keenan, front man for the band Tool, opened a winery in Jerome, Arizona. The Caduceus Cellars Tasting Room opened on July 4th, 2009 and has had some critical success in the wine trade. There is even a movie made about it, Blood into Wine. It follows the first year of opening and the challenges they faced. What is also of note is the location. There are wineries in all 50 states, Arizona is not the most likely place. Yet. Mick Hucknall, front man of Simply Red, owns a winery in Sicily called “Il Cantante” or The Singer in Italian. Also in Italy, there is Gordon Matthew Thomas Sumner, AKA Sting, who owns a winery in Tuscany. With names like “Message In a Bottle” and “When We Dance”, Sting has a large catalogue to pull from. Might I suggest, “Lithium Sunset”? If you want to include the Smoother Brothers in a list of musicians, you can find their wines grown in Sonoma County. There is no proof that the Material girl is a big wine drinker, but for the diehard fans, it is worth noting that Madonna’s father, Silvio “Tony” Ciccone owns a winery in Michigan called Ciccone Vineyards. Some better business-minded musicians and bands have formed partnerships with wineries. Locally, The Tragically Hip have lent their name, and arguably their best album cover Fully Completely, to a red wine made at Stoney Ridge Winery. And to celebrate the 20th anniversary of Trouble at the Henhouse, they released a Chardonnay called “Ahead by a Century”. It should be sold in two packs to honour the anniversary! Vince Neil of MÖTLEY CRÜE had a winery, and one-time in collaboration with Parducci winery in Sonoma. Should you want to get physical sometime, you can reach for a bottle of Koala Blue Wines, which located in Australia and is part-owned by Olivia Newton-John. Often it takes late nights and lots of wine to make a record and sometimes listening to records can make you stay up late drinking more wine. Some wineries are born out of passion, while others are just good business sense and an opportunity for the brand to have a further reach. Whatever the reasons, there is no denying that art and wine have a tight bond. This was something that I wrote for Geeks and Beats. You say Pigato. I say Vermentino. Lets call them all wine grapes! Last year I came across two Italian wines from the same producer. Nothing new there, but one was from a grape I had never heard of, Pigato. When I came home I looked it up in Jancis’s book Wine Grapes and the entry said, Vermentino. WTF? So I reached out to the producer who was kind enough to respond. Vermentino and Pigato belong both to Malvasia family and they are two different clones. The border between clone and cultivar is a subtle difference. In according with my personal experience, in the vineyards if you compare leafs and clusters you can see some differences: Pigato leaf is bigger and it has dark green colour, Vermentino leaf is smaller and less dark, and Pigato cluster is more compact compared to Vermentino cluster. Pigato it is also considered a clone more aromatic. The confusion about Italian grapes grew. A little more digging and I was unable to find a link to Malvasia. However, my suspicion is that the connection to Malvasia can be linked to a common synonym of Vermentino in Midi where it is called, Malvoise a Gros Grains and in Corsica where it grows by Malvasia Grossa. Then life got in the way and I left the Italian restaurant (buy me a beer and I’ll tell you the real story) and I forgot all about Pigato, Vermentio and Malvasia. I was invited to study with Ian D’Agata at the Vinitaly Academy in Verona and have been studying his book the Native Wine Grapes of Italy. During my reading, I began to recall my question about Pigato and Vermentino and hoped that this book would offer some solid answers. Turns out the answer is almost more confusing than the question. 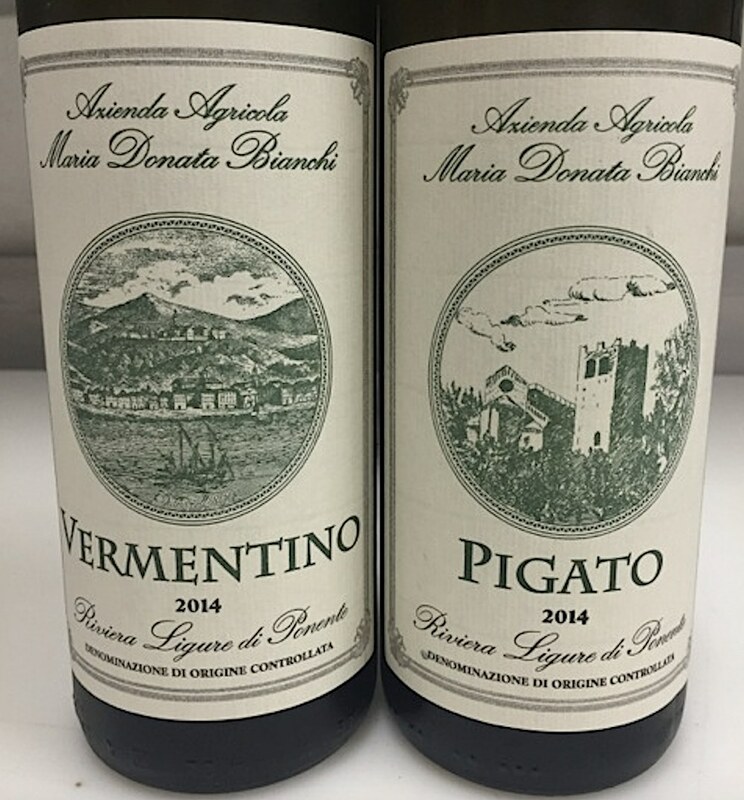 Is Pigato Vermentino? Is Vermentino Pigato? Or are both grapes actually Favorita? Don’t rule out Piccabon! Such is the study of Italian grapes. The producer, Maria Donata Bianchi, I queried initially is based in Liguria where Pigato is grown. D’Agata recommends wine from the DOC Riviera Ligure di Ponente Pigato where the wine in question comes from. That appellation is located on the Ligurian Coast not far from the French boarder. It is in this area where Pigato is most commonly grown. The Pigato grapes for this specific wine are grown in two separate locations, Diano Castello and Diano Arentino. Vermentino on the other hand is a grape widely planted in Italy where there is one DOCG that contains the grape and 22 DOCs. This is just one of many grape oddities in Italy. One need only to dig deeper into groups like Greco or Malvasia to realize just how confusing the grapes of Italy can be. Feuding territories, poor record keeping and proud people all contribute to not being able to properly identify wine grapes in Italy. But there is hope. With better scientific tracing, the grapes are properly being logged and nurseries are able to propagate the correct grapes for future generations of growers. There is such a rich history of grapes in Italy, far beyond the common ones that are most often encountered. With better understanding of them and how they grow, future wine drinkers will be in for many surprises. Go rgona, is both an island off the coast of Tuscany, and the name of the wine that is made on that island. The island is home to a small prison, which houses about 50-60 inmates. The white wine is a blend of Vermentino and Ansonica (a.k.a. Insolia or Inzolia in Sicily) grape varieties. The project is headed up by one of Italy’s oldest wine making family’s, Frescabaldi. It all started when Carlo Mazzerbo, the Gorgona penitentiary director, put out a call to find some help with the vines that they planted. The Frescabaldi family jumped on a boat and went directly to see how they could assist. Most of the inmates have been transferred from other prisons and are at the end of their sentences. To combat recidivism and help to integrate inmates once released, the prison planted a vineyard and even pay the inmates to grow the grapes and make the wines. Since then three former inmates have found work in cellars in Italy and a fourth is soon to be hired by Frescabaldi. The 2015 vintage of Gorgona wine, is the fourth vintage produced from the 1.8 hectare vineyard which was planted in 1999. There are roughly roughly about 2,000 bottles and 150 magnums produced this year. The wine is represented in Canada by Galleon, a division of Philippe Dandurand Wines in Ontario, come in six packs (at about $100 a bottle) and are not only great wines, but they are helping potentially marginalized people integrate back into society. Originally Published here on Good Food Revolution.